[Steemgigs] Coming: My biggest week ever. Some of you may not know that in addition to my life as a regular schmoe, on the weekends and nights I like to entertain crowds as a magician and psychic entertainer. I hope to eventually turn it into a full-time career, and quit my day job. Things are looking good on the magic front this week. I'm gearing up for quite a week. Prom season is upon us, and that means plenty of opportunities for people needing entertainment. I've figured, that in order for me to quit my day job, and "retire" to working as a magician and "probably psychic guy", I need to work 3-4 events every week. This week, I'm hitting that goal out of the park. Last month, I was contacted through an online gigging service to act as the opening act at bar entertainment. Bonus - the event takes place at a bar - less than an hour from me now, five miles from where I grew up, and less than a mile from my old high school. I still have several friends, family, and acquaintances in the area who stuck around in this rural section of western Indiana. 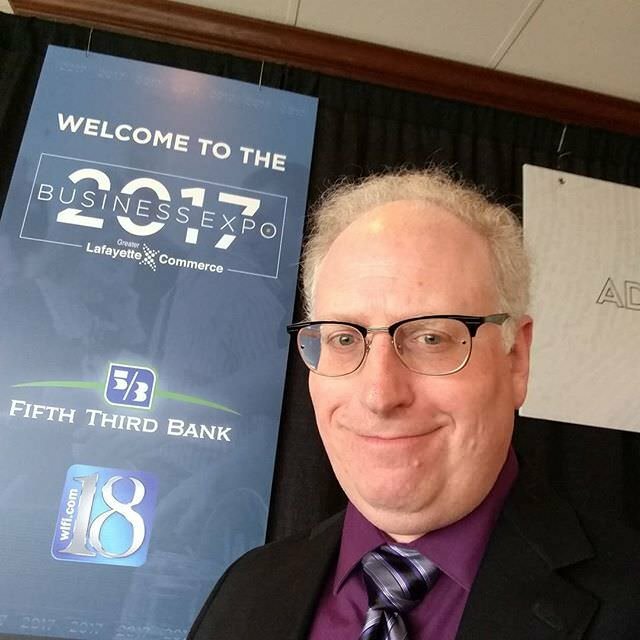 Then, also a couple of weeks ago, I noticed that my local chamber of commerce is having an area "Business Expo" convention. Basically, many businesses come and set up a booth to pitch their wares to anyone and everyone for an afternoon. They give out swag, make connections with the community, and that sort of thing. Last year I immediately saw this as a marketing opportunity! If they are there to make connections with the community, I (me as a magician) could be someone that could help them out. Many businesses have awards or employee appreciation banquets. I could provide the entertainment that would be different. I did my rounds during the 2017 Expo, handed out business cards and did close-up magic for those that wanted to see. I ended up getting one banquet out of the deal, and make connections with dozens of people in the community. It went so well last year, that I must do it again this year. This year's Expo is tomorrow afternoon. So, off I go to that. No cost, but no guaranteed income either. But it's good to get myself out there. And finally yesterday (this is the last one I swear) I was contacted about a last minute After-Prom for Friday evening. This is the evening before my bar show and after-prom show. Again, I'll be up until about 2am or so. Did I mention this is after my bed-time? So, I'm looking at 4 events, three paying shows, which puts me briefly above my necessary goal for full-time magician work. Basically, it would be what I need to survive if I did magic full time. Now if I can do that 51 more weeks, I'll be set. If you've stuck with me this long, you maybe are curious to see if I'm the real deal. Here's me entertaining some Purdue students a couple of weeks ago with a little psychic magic. You definitely want to watch this with the Closed Captions on. It was recorded in a very noisy room, and it's hard to hear us. If you think this would be fun - hit me up for entertainment! I'll perform mind-blowing entertainment to your business, club, organization, or even your house for your friends and family. Hit me up on my web page! Logos below of the Freelancer's Guild, The STEEM Engine Initiative, and SteemUSA owned by the respective groups. Wow @yekrats a magician and mentalist! I really hope you get to do this passion of yours full time! I can't wait to read you updates on all those events! All the best and may more come your way. Thank you, Khimgoh. I initially started learning magic because I thought my kids would like it. They didn't really like it, but I kept doing it anyway! It's turned into a second career. Thank you for your enthusiasm! I can see that you are enjoying your profession, there is no better feeling than to do what you really like. If you were closer to my country I would engage you to perform for sure. Whish you all the best! Thank you, Oleg. That's very kind! I've always been fascinated with performers of magic. Not so much for the magic itself, but for the motivation to do it. Ĉion bonan je via magia vojaĝo! Parenteze, dankon pro reviziti kaj voti min. Koran dankon al vi. Vi havas tre interesajn artikolojn en la angla kaj esperanto. Estas mia plezuro disvastigi bonan enhavon en Steemit!